Harvester BE 1035e represents a new step in agribusiness, being a product with technological innovations, support, training and monitoring. The result of our 55-year experience in developing and manufacturing machines, the BE 1035e is another launch by Valtra, a company that believes in the sector and develops products that contribute to increased productivity and improved quality of mechanized harvesting operations. The BE 1035e offers even more operator comfort, with a spacious and comfortable cab with low levels of noise and vibrations. 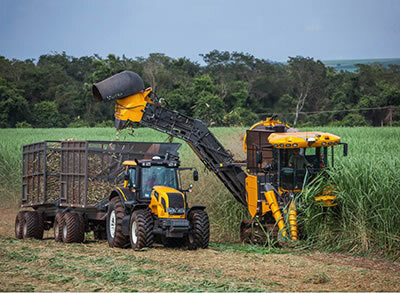 Its electronics system, developed especially for sugar cane harvesting, streamlines the operation, brings productivity gains and facilitates maintenance activities. 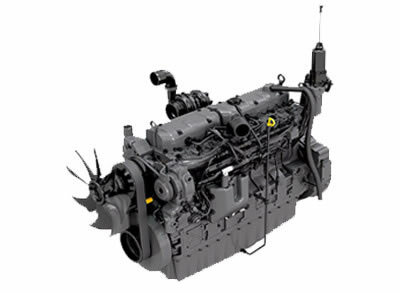 The 9.8L AGCO Power engine developing 350 hp @ 1850 rpm responds to the demands of high-performance harvesting with low consumption and a longer service life due to better adjustment of its torque/rpm ratio. 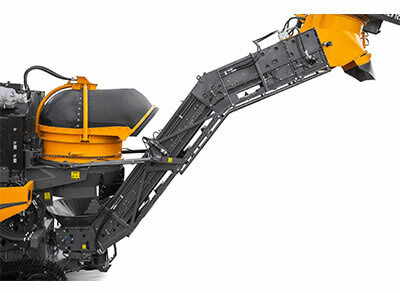 With options for harvesting of 1 or 2 lines, the “industrial system” of the BE 1035e is rugged and has features capable of achieving good productivity results with lower loss rates and greater quality of the harvested raw material (high cleanability). The onboard technology of the BE 1035e is another advantage. In addition to the best tools for precision agriculture, we offer the AgCommand telemetry system, an innovation in the sector which facilitates the customer-dealer-factory relationship and streamlines the technical support activities with the possibility of real-time monitoring. Powered by the 9.8-litre AGCO Power engine with 7 in-line cylinders, the Valtra BE 1035e harvester develops more power and delivers more capacity. Respected worldwide for its rugged and precise construction, the engine has been tested according to the highest industry standards. Everything is designed to ensure peace of mind and power when you require it. Even at the highest power, this engine delivers the maximum performance with the minimum noise and consumption. During the assembly of AGCO Power engines, all moving parts are balanced and each engine is individually tested on a dynamometer before leaving the production line. 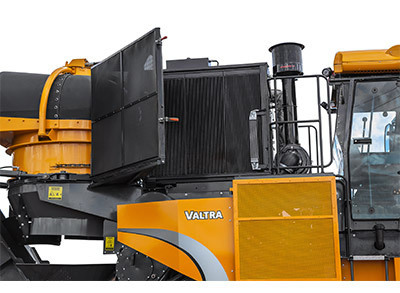 They are built exclusively for agricultural use, meeting the requirements of the most difficult harvests. - High-pressure injection and an effective air cooling system that help to control emissions. - More power and torque to maximize fuel economy. - The advanced fuel injection system that is electronically controlled by software to ensure that the necessary power reaches the machine. 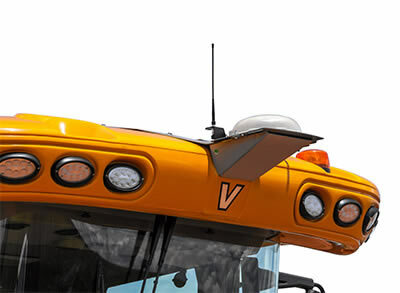 One advantage of the Valtra BE 1035e harvester is the main box with 5 outputs, which allows the optimal distribution of the engine power to the entire hydraulic system, pumps and engines. 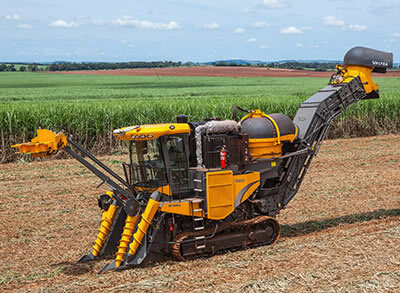 With an innovative design, it can harvest all types of sugar cane, with a working speed of 1,800 rpm. There are therefore no losses due to undersized or oversized systems. The machine uses high-performance synthetic oil, keeping the temperature below 70 degrees. It also has exclusive forced lubrication through the central pump, providing reduced downtime and increased mechanical availability. 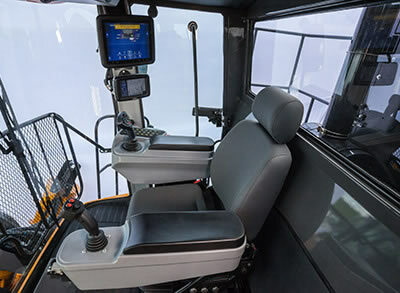 The cab of the BE 1035e sugar cane harvester offers increased interior space and greater visibility for the operator. On the BE 1035e harvesters, the controls are all at your fingertips with a touch of the screen. The console on the right contains multiple machine functions. The rotary multifunction lever further increases operating comfort throughout the workday. The electronics of the BE 1035e are simple and easy to operate. It features modern graphics and touchscreen technology. There is also the option to configure access to the machine via cards according to the profile, operator, leader and administrator and the option to store manuals and catalogs. 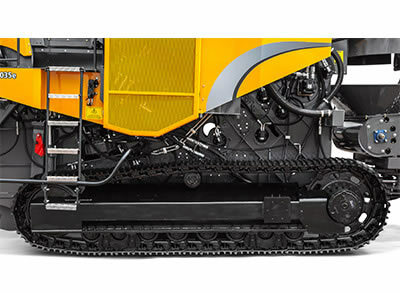 It has the headland mode function, which configures the machine to reduce the engine speed and raise the platform to maneuver at the end of the line. Keeps the machine on the exact route, avoiding gaps or overlaps. 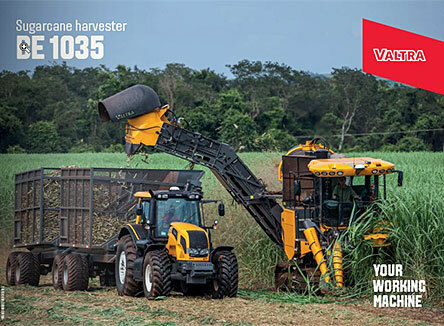 This is proposed by the technology solution that Valtra offers for its harvesters: the Auto-Guide 3000. AgCommand is the AGCO tool for remote fleet management, which provides customers and dealers with maximum visibility of all operations, showing where each machine is and what it is doing, whether it is working, stopped or maneuvering. It also reports when the machine needs to undergo maintenance and what maintenance should be performed. - Notifications appear in order of priority to help you meet the most critical needs first. - Information from the engine and the CAN network which determines when the machines are idle, stopped or need to perform some service is sent and stored automatically. - AgCommand has both 3G and 2G coverage, ensuring greater reach. - No dependency on mobile applications: AgCommand is fully accessible on your computer via Internet browsers and also via your mobile phone. * AgCommand is part of the precision farming and fleet management strategy of AGCO Fuse Technologies. The operator can view more than one reference line in the same work, write all lines crossed during operation to a single file and guide the machine using a project in Shape format. All this is achieved using a feature developed specifically for work with controlled traffic. The operator also has the option to manipulate the paths previously planned in the office through the monitor itself. 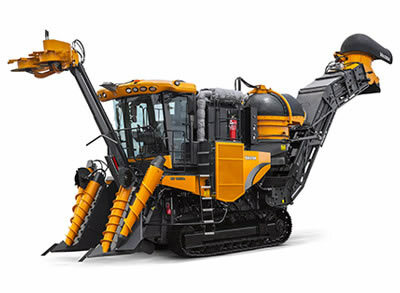 Thus, it is not necessary to create a project for each operation, since a single file can be used for all stages of cultivation, allowing the operator to perform the path adjustments from the machine directly, according to the operation to be performed. - Innovative design with better visibility and maintenance access without compromising performance. - Consists of 2 rollers with four blades. 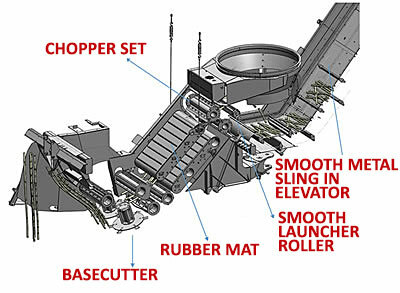 The output of the chopper roller with ejector roller, guide tray and side deflectors in the basket were developed to direct the setts to the elevator basket more efficiently. - Hydraulic system with gear pump to its drive and external mounting bearings to facilitate removal for maintenance. It has a grease reservoir to lubricate the rollers. - Ensures longer service life, avoiding unwanted stoppages thanks to the ruggedness of the entire assembly. They have a unique design that provides strength and durability. Through easy replacement, enables the transformation of the equipment for harvesting of seedlings or industrial harvesting. The Seedlings Kit is a patented system, in which all points of contact of the sugar cane with the equipment are protected by rubber, minimizing friction and increasing the protection of the buds. And now it has the new hydraulic tensioner of the upper belt. Another exclusive feature of the Seedlings Kit is the replacement of the feed rollers with a rubber mat, whereby the passage of the cane suffers the least possible impact. In practice, this means that it offers important advantages, such as a higher germination rate, bringing exceptional savings in planting and always producing better so that you can produce more and more. In the amount of seedlings per hectare, the Seedlings Kit provides greater savings in planting over other harvesters.